The premiere from 1875, at the Opéra Comique in Paris, of the opera “Carmen” – the last work of George Bizet – did not convince the music critics, the majority of them considered it to be a fiasco. Nevertheless, its popularity increased overwhelmingly after the death of the composer (he died a few months after the premiere), and today it is one of the most valued musical dramas of the Romantic era. Inspired by the third chapter of the homonymous novel, published in 1845 by Prosper Mérimée, “Carmen” takes place in Spain – the country of fiery tempers, but also of some bitter religious and political oppressions – where the story of Don José, a naïve soldier, and of Carmen, a beautiful gipsy woman whom he falls in love with, takes place. Written in the comic opera genre (librettists: Henry Meilhac and Ludovic Halévy), “Carmen” portrays the Spanish proletarian life with its iniquities and immoralities, and by this – but also by the fact that it presents the tragic death of the main character – Bizet’s work brought a new vision in the French opera. Some critics considered it as a juncture between the tradition of the French comic opera and the verismo of the Italian opera of the 19th century. 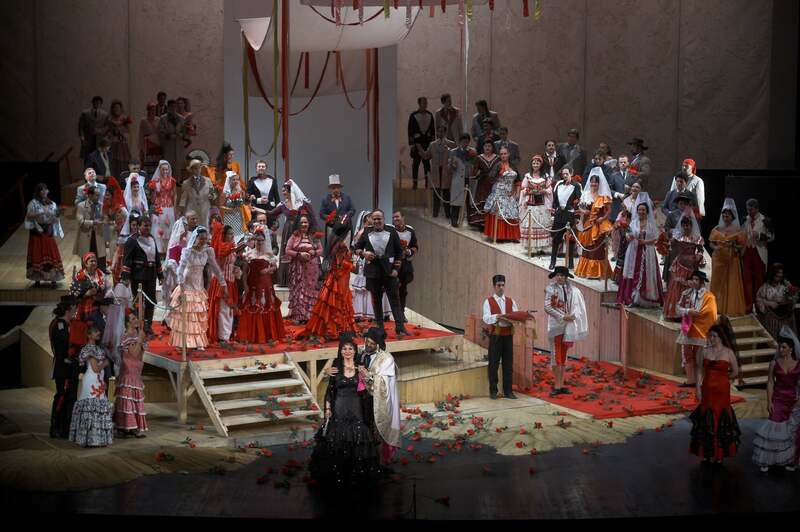 The countless stagings of the opera “Carmen” also include the productions in Bucharest, created – only ten years after the world premiere in Paris – by Romanian promoters of lyrical genre, such as: George Stephănescu, Eduard Wachmann and Constantin Stănescu Cerna. Young Micaëla approaches a group of soldiers inquiring about Don José. On hearing about her visit, Don José evocates his native land. The beautiful gipsy girl Carmen tries to seduce him and, before resuming her work at the tobacco factory nearby, offers him a flower. Coming back, Micaëla tells Don José that his mother wishes to see him married. Noises can be heard: Carmen is wrestling with another woman. Don José has to arrest her, but Carmen subdues him with her charm and gives him a date at Lillas Pastia’s tavern. Blind with passion, Don José helps her escape and surrenders to the guards. At the tavern of Lillas Pastia, the smugglers sing and dance. The toreador Escamillo flirts with Carmen. After the guests leave, the smugglers make plans for an outing. When the recently freed Don José arrives, Carmen dances for him and cannot accept his wish to go back to the barracks. Although she insults him, he confesses his passionate love for her. Their parting is inevitable, but his resuming his honest life is also impossible. Carmen cannot stand the jealousy of Don José, who regrets having given up the soldier’s life. The girls throw the cards, which show Carmen a tragic end. While Don José is on patrol, enters Micaëla. A gunshot makes her hide behind a rock. Don José has spotted Escamillo, who is looking for Carmen. Don José attempts to kill him but is hindered by the smugglers. Micaëla begs him to go to his mother’s deathbed. The separation of the two lovers is irreversible. Don José follows Micaëla while Carmen listens to Escamillo’s singing. In front of the arena of Seville, the crowd is waiting for the bullfight. Escamillo is escorted by Carmen. Despite the warning that Don José is not far, Carmen is not afraid to confront him. After a violent scene, the young woman is stabbed to death. The cheers for Escamillo’s victory are interrupted by her tragic end. Ce-n veci cu legi nu poţi să-l stăpâneşti. Şi de-mi eşti drag, să te fereşti! Să n-o aştepţi e-n faţa ta! Tot tu în laţ ai nimerit!